Can you name this statue? Retrace the steps of America’s greatest explorers from Pennsylvania west to Washington, and make your next family vacation an unforgettable expedition of discovery. Retrace the steps of America’s greatest explorers from Pennsylvania west to Washington, and make your next family vacation an unforgettable expedition of discovery. In 1803, Virginian and frontiersman Meriwether Lewis prepared to embark on a long and arduous journey with his former Army captain and friend William Clark that would forever place the pair on the map of American history. Their mission: Find a water route to the Pacific. 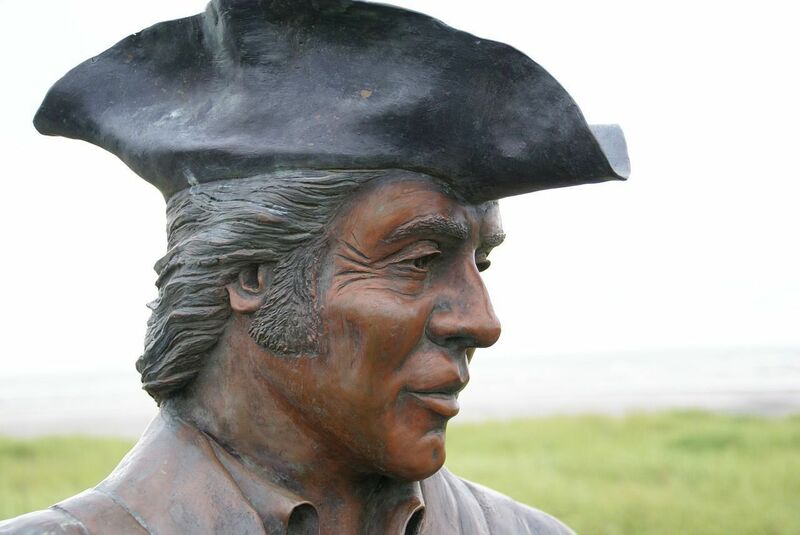 Today, you can relive their journey along the Lewis and Clark Trail, which is dotted with historical centers, scenic points of interest and statues immortalizing the incredible expedition of the two leaders and their team, the Corps of Discovery. These are just a few of such fascinating points along the trail. If you pretend your minivan full of kids is a Conestoga wagon packed with supplies, equipment and, presumably, smelly and weary explorers, you can start your trek at the Academy of Natural Sciences’ Lewis and Clark Herbarium. The Herbarium is located in the Botany Department at The Academy of Natural Sciences in Philadelphia, where more than 200 dried and preserved plant specimens brought back from the expedition can be found. Dipping down into Kentucky, you’ll find the 1800s era Ohio River town of Maysville as well as the Washington Historic District, which is a throwback to log cabins and old shops and museums of the 1790s. Here, it’s believed that Lewis sought out the expertise of John Colter, who later discovered the Yellowstone National Park area in 1808. The Kentucky Derby Museum in Churchill Downs of Louisville is certainly famous for its historic racetrack, but a little known fact about the museum is that it not only chronicles the history of the famous derby but also has ties to the expedition through its founder, Meriwether Lewis Clark, Jr., the grandson of William Clark. Adult admission is $12, young adults $10, children (5-12) $5, and children under 5 get in free. Your admission will include a Historic Walking Tour of Churchill Downs, “The Greatest Race” 360-degree high-definition film, two levels of permanent exhibits as well as special exhibits. Also in Louisville, the Filson Historical Society is home to a collection of letters, diary entries and expedition documents kept by both Clark and Lewis. A 55-foot keelboat rests within the Lewis & Clark Interpretive Center (618/251-5811) in Hartford, Illinois, and shows the crude means of transportation the contingent used to ford the rivers they encountered along the way. The center has 14,000 square feet of exhibits, displays, artifacts, and multimedia renderings that emphasize the Corps’ preparations for the expedition. Hours are 10 am to 5 pm, Wednesday through Sunday. Nearby, the Lewis & Clark Confluence Tower (618/251-9101) teeters 180 feet from the ground and allows explorers to view the convergence of the Missouri and Mississippi rivers from observation decks. Prices are: $4 Adults, $2 Children 12 and under, Children 2 and under are free. Tours on the hour from 10 am to 4 pm Monday-Saturday and from 12 pm to 4:30 pm Sunday. 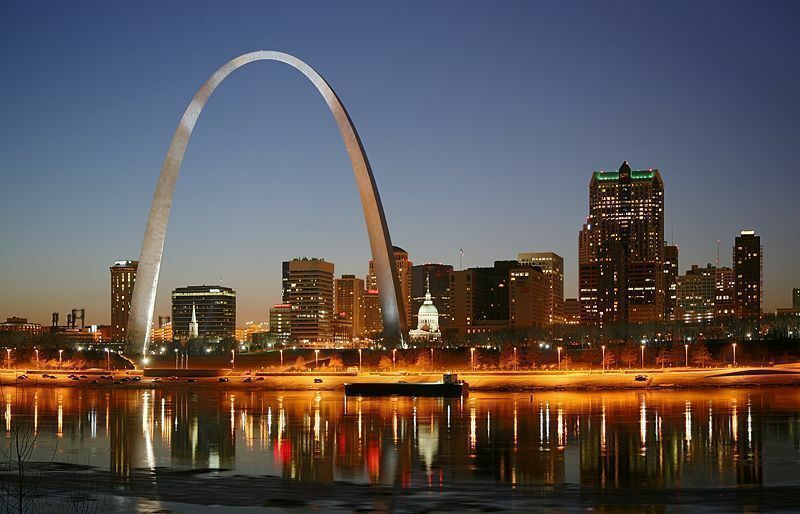 St. Louis, Missouri has a number of attractions along the Lewis and Clark Trail, including the Jefferson National Memorial Museum of Westward Expansion, which is situated beneath the immense 630-foot Gateway Arch and details the explorers’ mission. The arch is accessible by tram and, once at the top, visitors can spot the Gateway Geyser, the world’s tallest fountain. Thomas Jefferson, who commissioned the expedition, can be seen immortalized in marble in the Jefferson Memorial Building. Those passing through St. Louis can also stop to see the statue of “Captain’s Return,” which commemorates the return of Lewis and Clark from their long journey. The statue stands in the shadow of the Arch on St. Louis’ Riverfront. It should be noted, too, that the Bellefontaine Cemetery here is the final resting place of William Clark. Nebraska City in Nebraska is notable for its Missouri River Basin Lewis and Clark Interpretive Center, which focuses more on the scientific cataloguing of the explorers’ discoveries of flora and fauna. The center is open all week long. Passing through Bellevue, you can see the National Children’s Lewis and Clark Interpretive Art Wall, displaying young artists’ sculptural artwork detailing the journey. 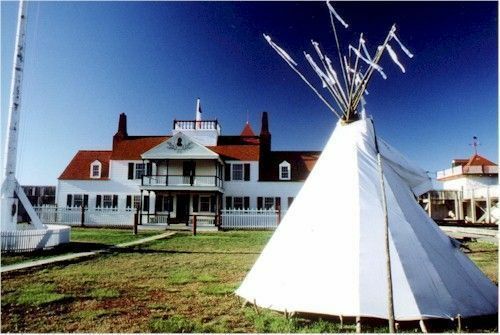 At the Spirit Mound Learning Center (605/677-5228) in Vermillion, South Dakota, guests can get a sense of relations between the Corps of Discovery and the indigenous tribe of the Sioux Indians. Though it may not be the most impressive feature of the trail, the small hill known as the Spirit Mound holds Sioux legend as the place where spirits were said to have killed wary or curious explorers. In Chamberlain, South Dakota, you’ll find the Keelboat Visitor Center, where you can actually experience the travels of the pioneers by boarding a replica of the keelboat. Farther north in Williston, North Dakota, both the Yellowstone & Missouri River Confluence Interpretive Center (701/572-9034) and the Fort Union Trading Post Historic Site (701- 572-9083) display the evidence of the group’s trek through the area, the latter being a significant center for fur trading. The Lewis and Clark Interpretive Center (701/462-8535) and Fort Mandan features a full-sized reconstruction of the trapezoidal fort, while not far away, the Knife River Indian Villages National Historic Site (701/745-3309) is renowned for being the place where Lewis and Clark gained the most invaluable member of their Corps, Sacajawea. For a more outdoorsy experience of Lewis and Clark’s travels, head to The Sacajawea Interpretive, Cultural and Education Center (208/756-1222) in Salmon, Idaho. Also consider taking the journey across the state toward the Idaho-Washington border to Spalding, home of the Nez Perce Cultural Museum (208/ 843-2261), open daily 8 am to 4 pm, which details relations between the Corps and the Nez Perce (pronounced “nayz piers”) Indian tribe. Entering the final state of the voyagers’ quest to reach the Pacific, visitors will find the second largest monolith in the world at the Beacon Rock State Park in Washington, where Clark led his team down river to view its rapids. The park includes 9,500 feet of freshwater shoreline on the Columbia River. Actual artifacts and trails to the lighthouses of North Head and Cape Disappointment can be discovered at the Fort Canby State Park and Lewis and Clark Interpretive Center. To celebrate the end of your long (or short) journey, retrace the steps of Clark’s party along the 28-mile Long Beach. See the route for yourself by visiting the website that details the Lewis and Clark trail, and read more about discovering Lewis and Clark in FTF’s article Following Lewis and Clark through Washington. Select photos courtesy of LewisAndClarkTrail.com.